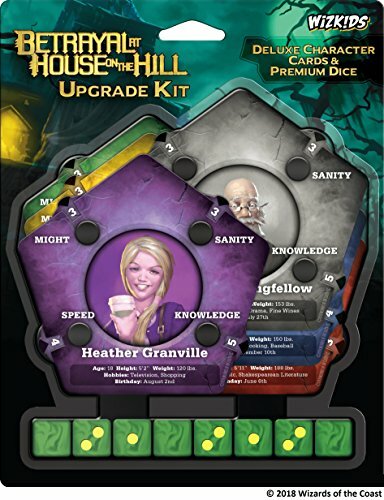 Betrayal at House on the Hill: Upgrade Kit — GamingWithSwag.com - Dads By Day, Gamers By Night. Wizards of the Coast (Hasbro) released Betrayal of House on the Hill under the Avalon Hill label in 2004. An outstanding, “never-the-same” adventure game, it introduced significant elements of replayability onto the board game scene, and was catapulted into even greater popularity with its re-release in 2010. BaHotH is highly replayable and random for two reasons. One, because when a specific event is triggered, there are dozens upon dozens of possible scenarios that you might get assigned to play depending on the cards and the rooms that are involved. Two, the tiles you place in order to create the different floors of the mansion, can be put together in a seemingly endless combination. With the 2010 re-release, while the gameplay was still unpredictable and exciting, there was one glaring issue with the components. The character boards, and the slidey-pointy-clip-a-doos (as I’ve dubbed them) weren’t always a perfect fit. Either the boards were too small or the clips were too big, which led to the clips not staying put as one would have hoped. Some fans resorted to boiling the plastic clips to reform them, or even swapped them out for standard, run-of-the-mill paper clips. This was a sporadic problem, with some clips in a box being completely fine, and others being loose. Hasbro, not one to take this issue lying down, decided to pump out an upgraded component set in late 2018. The new components include some beautiful, marbled premium die (see pics) and a set of new character boards, complete with fantastic new artwork and a solution to the slidey-pointy-clip-a-doo issue. The new boards are basically a sandwich now. There’s a top plate and bottom plate, and in the middle, are rotating dials. The stat dials are built in, so there’s no chance of them slipping off and getting lost in your carpet. Okay, so while I really feel like overall this was a huge improvement to the game, I can’t help but think the design is still somewhat flawed. The dials, while nice and permanent, don’t allow you to see which direction is increasing and which is decreasing and there is no indicator on the character disc itself. Over time, I’m sure this will start to become second nature, but it takes getting used to. However, the artwork is a HUGE improvement and the die are just so much cooler than the plain white and black ones. Plus, having two sets of die make it so that you can have one within reach of everyone at all times. All in all, for $15, this is definitely an affordable and worthwhile upgrade.